The skin is an organ through which the body eliminates impurities and absorbs essential moisture, nutrients and oxygen. We offer a selection of pampering body treatments designed to assist and enhance the skin’s natural functions and maintain its natural beauty. Encourage your body’s natural slimming process with this intensely active body wrap. You will enjoy the dual sensation of invigorating heat and revitalizing cool energies as this cryothermic gel activates your microcirculation. As you’re wrapped and relaxed, this intensive thermal process will immediately begin to target puffiness and swelling due to water retention, unwanted toxins, and sluggish microcirculation from lack of exercise. The result is a more toned and revitalized body. 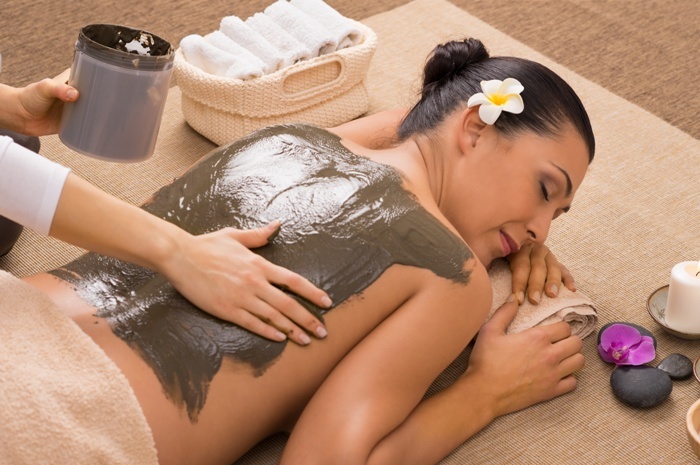 Detoxify and stimulate your skin’s metabolism with therapeutic mud and aromatherapy. In this revitalizing treatment, mud therapy is applied to your entire body and you are cocooned in warm blankets to jump-start the purification process. The mud mixture will unleash a stimulating action, helping rid your body of toxins. Emerge from this invigorating treatment refreshed and re-energized. Especially effective if you have been overindulging and need to detox. Smooth and retexturize from neck to toes with polishing Chinese granules that leave skin silky smooth and revitalized. You’ll experience the warm application of massage oil, followed by the dual action exfoliation of medicinal Herbology herbal massage from neck to toes. Finally, hydrating body cream will melt into your skin, leaving it softer and smoother than ever.